A portrait of Theodore Roosevelt Schellenberg, 1903-1970, taken at the Barker History Center at the University of Texas in Austin. Born in Harvey County, Kansas, Schellenberg received both his A.B. in 1928 and M.A. in 1930 from the University of Kansas, and his doctorate in history from the University of Pennsylvania in 1934. In 1935, he was appointed to the staff of the National Archives, but he left in 1945 to serve for three years as Records Officer at the Office of Price Administration. 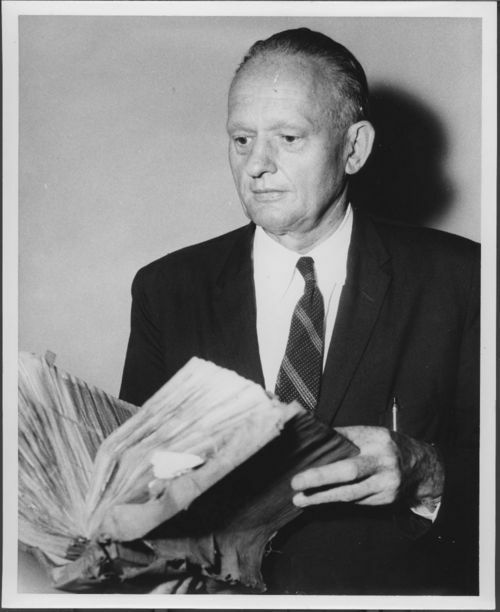 He returned to the National Archives in 1948 as Program Adviser to the U.S. Archivist. Schellenberg was named Director of Archival Management in 1950 and served as Assistant Archivist for the National Archives from 1956 to 1963. Schellenberg wrote "The Management of Archives" and "Modern Archives," which have become respected textbooks on archival administration. He retired from the National Archives in 1963, and died in 1970. People - Notable Kansans - Schellenberg, Theodore R.